Irish dance classes for boys and girls age 4 and up. Held every Saturday at 11 am at St. Anthony's/German school on Everett Street in Allston/Brighton. We offer competitive and non competitive events, clinics, and summer camps. Classes run September thru June and children can join at anytime. Tuition is $100 for 2 months of classes and there is one time registration fee. We have been teaching boys and girls age 4 and up , both modern and traditional Irish dancing for over 60 years. We Love passing on our Irish heritage, culture, and traditions to the next generation. Our dancers compete at local, regional, national, and international competitions. They have won solo and team titles at many events, including the world championships. Our dancers perform throughout the year at schools, festivals, concerts, weddings, and corporate events. 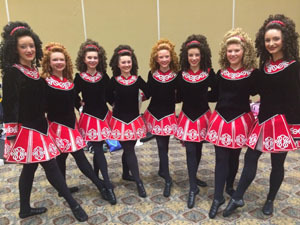 They have performed at the state house, Fenway park, boston's first night and in the spring of 2016 they performed on stage at the citi center theatre with Riverdance! Several of our dancers have gone on to professional careers with Riverdance, Lord of the Dance, and other shows. We offer classes north and south of boston as well. Contact lisa at osheachaplin@hotmail.com for more info and availability.